Are you ready to protect and serve your community? Well, that's quite the demanding profession. How about before diving in head first, you try it out for a night. Halloween will be perfect. Grab a blue uniform or a detective's guise and you're halfway there. All you need to do then is complete your costume with this Authentic Cop Badge. This silvery accessory will shine bright and make you a beacon of justice that lights up the night. This simple Police badge accessory is made of plastic, and it is made to look like shiny metal. 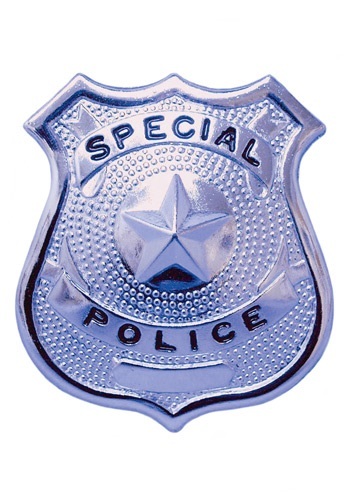 "Special Police" is molded into the badge to looks authentic. The badge easily pins onto your costume. Just remember, unless you are an actual Police Officer that went through rigorous training, you shouldn't be flashing a badge around to people who think it's real. It's not! If being part of the 'Special Police' unit excites you, then after Halloween it may be time to get enrolled into the nearest academy for everyday heroes. This crazy world needs as many brave souls protecting and serving the public as possible. But for Halloween, just have some fun safe and sound with this fake Police badge.